United States > District of Columbia > Washington Hotels > InterContinental Hotels THE WILLARD WASHINGTON D.C. 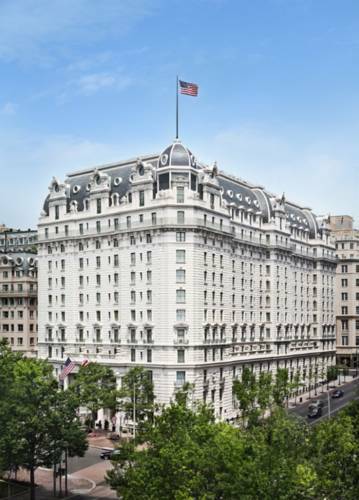 Since 1850, the Willard has epitomized Washington luxury hotels and remains a destination for the worlds power brokers and visitors drawn to the nations capital. The hotel is charming and sophisticated, situated in a coveted location: just two blocks from the White House and National Mall. Revered by locals and guests, the Round Robin remains a lively meeting place since the days of Abraham Lincoln. After a busy day in D.C., enjoy a relaxing treatment at the Red Door Spa. Crystal Room: Located just off Peacock Alley, the Crystal Room features fluted pillars and striking columns, dazzling crystal chandeliers and sconces reflect its turn of the century opulence. Ballroom: The Willards Grand Ballroom with its buttercup yellow, pale blue, and soft green hues, beveled mirrors, crystal chandeliers, and beautifully hand-painted landscape. Peacock Lounge: Upper portion of the Peacock Lounge provides a small reception area for cocktail parties. Peacock Lounge Lower: Located off of Peacock Alley, the Peacock Lounge provided an excellent location as a Pre-event reception held in the Crystal Ballroom, located across the hallway or indepentently works will with small dinners or business meetings. The Nest: Overlooking Pennsylvania Avenue, the Nest offers a beautiful location for the small intimate social affair, dinner, or reception. The room is often used for breakfasts or lunches or provides a private location for that Bridal tea or rehearsal dinner. Buchanan: Located on the Ballroom level of the hotel, the Buchanan pairs well with the Pierce room offering an alternative location for meals and other breaks. Used as a compliment to the Grand Ballroom and Pierce room allowing space for the larger gala events. Fillmore: Located on the Ballroom level of the hotel the Filmore room offers a private location for the small boardmeeting or breakout. Garfield: Located on the Ballroom Level, offers perfect location for small board meeting or location for a small breakout for a larger program. Pierce: Beautiful mahagony-walled meeting room, located on the Ballroom Level of the hotel. Often paired with the Buchanan Room, this space works well for meetings, and dinners and receptions. Taylor: Located on the Ballroom level, offers a private location for meetings and small social events. Brandeis: Sunlit filled room, perfect for small meeting or intimate social event. Stone: Small meeting room located on the second floor adjacent to the Douglas room, offers an option for breakouts or private dining and breaks. Taft: Located on the 2nd floor, this meeting room can accommodate 28 people Hollow square, or a banquet up to 60 people. Conveniently located centrally in the hotel with easy access to guest room floors. Grant Suite: Located on the 2nd floor, this room resembles a private suite. Guests are greeted by an entrance foyer, followed by an oval parlor overlooking Pennsylvania Avenue. Perfect for the small executive board dinner or meeting. The Willard Room: Washington DC's most premier event space. Located off of Peacock Alley, this room is perfect for the high level dinner, reception, or social event. With its chandaliers, high ceilings and elegant panelling this room is unmatched in the city. Breezeway: Located between The Occidental Grill and The Willard. Chase: Located on the 2nd floor. Ideal for small group meetings or receptions. Douglas: Located on the 2nd floor. Ideal for small to medium size groups and receptions. Can connect to Chase for additional space. Holmes: Located on the 2nd floor. Ideal for small to medium sized meetings and receptions. Connects to Hughes room for additional space. Hughes: Located on the 2nd Floor. Ideal for small to medium sized groups or receptions. Connects to the Holmes room for additional space. Shops at Wisconsin PlaceBloomingdale's, Sack's,Lord and Taylor are just a few of the stores you will find in this area. HALF A DAY:Start the day with a visit to Old Town Alexandria that dates back to the 1700s. It was there that tobacco was traded in Virginia. It is now surrounded by architectural heritage. Then take a tour of George Washington's estate, Mount Vernon. TWO HOURS WalkWalk along the National Mall, discover all the monuments like the Lincoln Memorial, Reflecting Pool, WWII memorial, the Washington Monument and the Jefferson Memorial. BUREAU OF ENGRAVING AND PRINTINGDollars bills are printed at the Bureau of Printing and Engraving. Tour tickets are given out at 8am daily but we can arrange these for you. HOLOCAUST MUSEUMTip: Lines are long, to avoid them, see the Concierge for special issued tickets. Museum of WW II genocide.